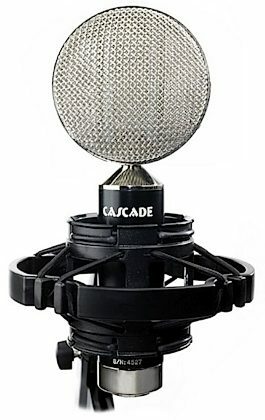 Bring classic warmth and presence to your recordings with Cascade Microphones' Fat Head II. Keep this rock-solid ribbon microphone within reach when capturing anything from acoustic guitars, pianos, strings, and other instruments to guitar cabinets, vocals, and drum overheads. Cascade's Fat Head II ribbon mic gets its balanced, superior sound from a Swedish-made Lundahl LL2913 transformer. Its sensitivity and 30 to 18 kHz frequency range are especially versatile for capturing the magic of live-sound applications. As with other microphones in the Cascade lineup, the Fat Head II's ribbon element is hand tuned for precise performance and a naturally open sound. Sonically the same as the original Fat Head, the Fat Head II has been upgraded with a reinforced neck and grille, a gold-plated XLR connector, and a larger brass body that helps protect the mic from RF noise. Almost all ribbon mics offer a figure-8 bidirectional pickup pattern, meaning that they pick up sound from the front and back, not the sides. Accordingly, the Fat Head II is live on both the front and rear end, making it perfect for recording two sources side by side. Try tracking a duet with two singers, horn players or string players on either side of the mic. Or simply place acoustic foam at the rear of the mic, and use one side of the figure-8 pattern to get extreme isolation on your source. You can also use a figure-8 mic as the "side" microphone in a middle-side configuration. A step up from its predecessor, the Fat Head II sports an upgraded polished nickel grill, neck and nut with a larger body. Keep the mic looking like new with the included micro-fiber cleaning cloth and storage pouch, and lock it up in its aluminum case when not in use. zZounds is an authorized dealer of Cascade Microphones products. The Cascade FAT HEAD II with Lundahl LL2913 Transformer offers the natural and open sound associated with the finest ribbon microphones. You will find that when recording acoustic guitars, guitar cabinets, vocals, drum over-heads, and countless other types of instruments, the ribbon microphone will produce the warmth that is vital to today's digital recording environment. We firmly believe you will also agree that this microphone will make a great addition to your collection. Cascade Microphones inspect the audio and built quality of each and every Cascade microphone before it leaves our shop, once you try one... you'll be a believer. Polished nickel grill, neck and nut with a larger body. Sonically the same as the standard FAT HEAD. "Cascade Fat Head II w"
Overall: Opened the box and wow, first thing I noticed is the packaging.. Comes in a smart aluminum hard shell case which foam lined to protect the Mic and shockmount.. The mic is in its own wooden box.. When I opened the box, ok I had my second WOW! This mic is not only gorgeous, it is very solidly constructed and it is much larger than I imagined.. Enough on the eye candy, Later today, I set it up in front of my Alvarez acoustic guitar and recorded my first cut with no EQ and just set the mic about 10 inches in front of the sound hole.. not very scientific I know but just the same I got a gorgeous sound with no EQ on playback.. I heard bass response from my Alvarez I had never knew existed.. and the harmonics just rang out so pure.. Then it was time to do some real world work, and with the help of my engineer, we cut a VO for a video I am working on.. once again, no EQ in or out and my voice over was full and also had plenty of clarity, a must in a voice over.. I will likely buy another soon! Get one or you just have to blame yourself for buying a Neumann U 87 for mega cash.. when you can get this kind of sound for under $500.